Imagine becoming an artist where your inspiration comes from observing your everyday life. You would gain an eye-opening appreciation for the town or city you live in and places you visit. Bustling crowds, interesting architecture, and wonky lamp posts would become your subjects and a fine-line pen your only drawing tool. 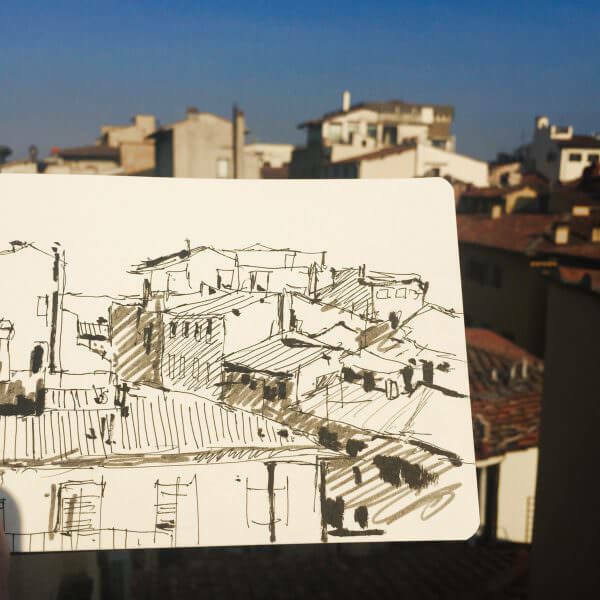 This drawing course looks at how to develop the habit of Urban Sketching – sketching the everyday environment around you. Creating a visual diary of the world and develop the daily practice of recording the story of your life through sketches. Over 3 hours of tuition, you’ll develop an eye-opening appreciation for cities and towns and their surroundings from the view out of a bus window to a half-built construction site. It will enable you to practice your drawing skills and create fast, bold urban sketches with pencils, pens, or watercolours, whatever tools you have on hand. 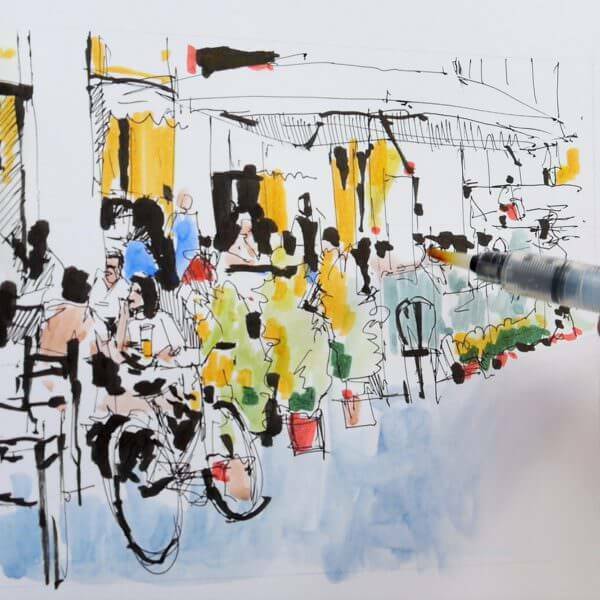 The simple step-by-step tutorials follow a logical progression from creating frameworks for successful sketches, understanding perspective, using tonal blocks for a composition to capturing the movement of individual figures and bustling crowds. You wouldn’t have to wait until you had the perfect view in the perfect place with perfect pencils and the perfect light. 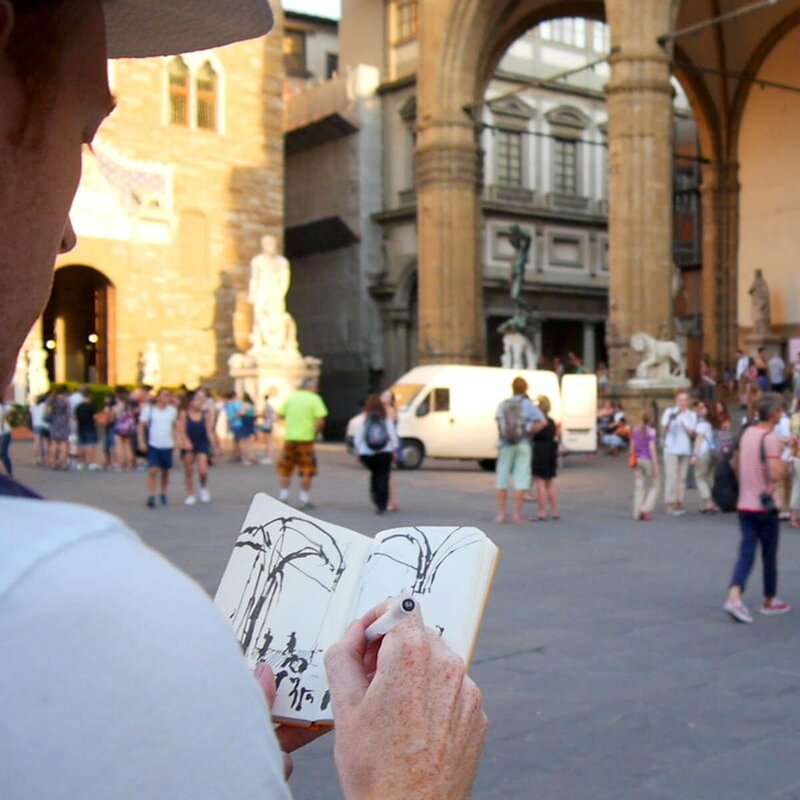 Creating a visual diary of the world around you, developing the daily practice of recording the story of your life through sketches, is what’s so exciting about ‘urban sketching’. But would you be happy with your drawings? You could say that no artist is ever truly happy with their finished works but learning how to move away from overworked drawings can be a hard stage for many beginners. But what if your wonky lines and ‘mistakes’ actually turned into an asset? Learning to embrace the wobble, loosening your style yet still creating a drawing that looks realistic yet sketchy, is what I want to teach you on this course. You can learn to leave the eraser at home and develop a confidence with line. By setting up a simple framework of a scene and focusing on the key points in the gesture, your sketches of places and people can come to life. I’ve developed a this course to show you exactly how I approach my sketches when drawing in the city, the materials I use and how you can do the same thing. I’ve included an introduction to the materials you’ll need and demonstrations on how to create frameworks for successful sketches using free-hand vertical lines, perspective, and tonal blocks. The lessons follow a logical progression, from sketching buildings and monuments to capturing the movement of individual figures and groups of people in cafes. I want this course to demystify the urban sketching process and slowly introduce new concepts, from tackling static buildings and perspective to adding movement of people and capturing crowds. When you understand the steps to take, it can be empowering to think ‘I think I can do this’. 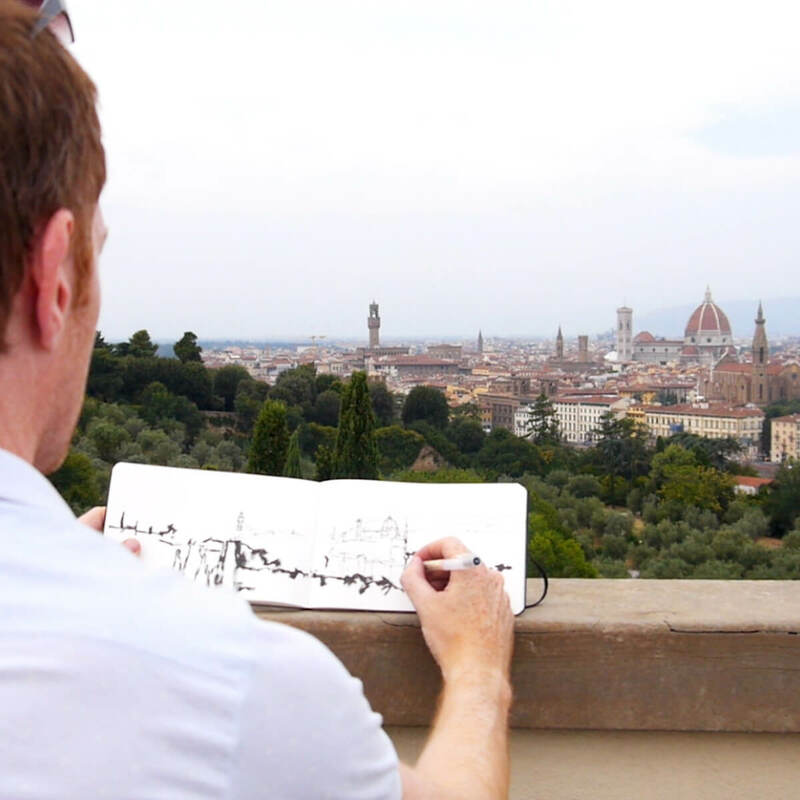 On-location drawing demonstrations in Cornwall, England & Florence, Italy. 15 follow-along drawing demonstrations (including watercolour wash drawings). 6-downloadable video lessons, split into separate chapters that follow on sequentially. Downloadable jpeg reference, drawing worksheets and a full materials list. Over 3 1/2 hours of detailed video instruction. An introduction to a range of multi-purpose sketching materials that fit easily into a pocket or satchel. Open your eyes to the drawing opportunities that surround you every day, learning to capture a moment in time within a hectic environment. Discovering the importance of verticals lines and free hand architectural structures that form the framework to your sketches. Introducing tone with simplistic tonal blocks to balance composition and reveal light & shadow, using pencil, pen & colour. Introducing cityscapes, rooftops and panoramas, sketching the cityscape in twilight & nightlight, including a ‘Silhouette Skyline’ incorporating watercolour washes. Observing the early morning light, capturing shadow shapes on Italy’s intricate rooftops and tackling the tricky subject of perspective on location. Creating a realistic individual figure using ink, pen & wash. Quick tips and techniques when introducing multiple figures into your drawings, giving a sense of movement and scale. Capturing a busy crowded cafe scene using bold pen marks and watercolour marker washes. Sketching a monument with sepia pen and wash. Observing nature, trees, bushes and water incorporating watercolour washes to add colour and life. Capturing street furniture in strong light, observing dramatic shadow shapes with fine line pens and markers, looking at the different thickness of pens. A final project of a busy street scene incorporating vertical architectural structures, street furniture, a wide tonal range, colour contrast and figures. Looking at composition, tonal balance and adding watercolour washes to bring the sketch to life for this final piece. I’ve taken care to film everything from my perspective so you can see exactly what I’m doing as we go through the entire drawing process in real-time with over 3 1/2 hours of video instruction, alongside full-colour photographs and drawing guides. 6 Downloadable Step-by-Step Video Lessons – over 3 1/2 hours of video instruction that once downloaded – you have any time, anywhere access. A ‘Your Urban Sketching Downloads PDF’ – which includes all the reference images used throughout the course. A broadband internet connection – the files sizes for the video lessons are quite large (3 GB in total) so can take a while to initially download (depending on your internet speed.) Once downloaded, they are yours to keep forever, watch without buffering or take to the garden and watch away from an internet connection! Enough free space on your Computer or iPad – You can download the files to a separate USB stick if you need more storage space. Will, A year ago I took your Urban Sketching class. I had a little sketching experience and had tried to paint a few times, but my eye was too sophisticated for my skill set and I was always unhappy with what I produced, even when others liked it. I took your class and not only enjoyed it thoroughly, but found myself able to stick with it and practice for the first time. I liked that you recommended specific pens and products and found that they worked for me as well. Your descriptions and instructions were soothing and encouraging but, more importantly, they are detailed and they work- and you never talk down to the student and neither oversimplify things that are complicated nor complicate the simple things! Your step-by-step sections helped me see the thought processes and the steps and also helped me to trust my instincts and develop my own style even as I tried to copy exactly what you demonstrated. I practised in a notebook in the evenings and just enjoyed the process even when the drawings were TERRIBLE and the perspective totally off, I took your advice and just stayed in the moment and had fun with the play of ink and water and line and colour. Within a couple weeks I had improved enough that I began to share sketches on social media and in a few months people were asking to BUY them, so I had to begin playing on better paper! It is a year later and I’m drawing and painting up a storm and about ready to take your portrait class. People remark on my “talent” and “relaxed style” — that is all a result of your teaching and your sense of humor and the techniques and attitude your classes cultivate. This class not only taught me a lot, but stated me on a path towards drawing and painting as a main part of my life, influencing much more than I could have anticipated. I’m selling drawing myself and paintings — something I literally never expected. What if I can’t draw? Are there any courses you would recommend before this course? Well, wobbly lines are a must for urban sketching! If you’re an absolute beginner who hasn’t even picked up a pencil before you might take to sketching street scenes as your natural style! – but if you’re not sure, I would recommend you take a look at my Absolute Beginners Drawing Course. It will guide you through all the basic materials and show you how to really understand how drawing ‘works’ when observing from life.